Mr. Justice Aamer Farooq in his judgment has decided the issue regarding suspension of sentence and bail under NAB Ordinance in Writ Petition No. 352 of 2019.
grounds. It is pertinent to observe that previously, a petition under Article 199 of the Constitution (W.P. No.32-2019) was filed by the petitioner, seeking suspension of sentence and release on bail on merits of the case, however at his request the referred petition was dismissed as withdrawn. 2. Learned counsel for the petitioner, inter alia, contended that petitioner has a severe heart disease as well as chronic kidney disease; he also is hypertensive and diabetic. Learned counsel took the Court through various reports submitted by Medical Boards and Teams of Doctors constituted upon the orders of Home Department, Government of Punjab time and again. On the basis of referred reports, learned counsel contended that recommendations of the doctors are that petitioner needs stress free environment and also should undergo angiography, if his other ailments are under control. Learned counsel pointed out that the petitioner cannot have best of health conditions, if he remains incarcerated, as twenty four hours monitoring is not available plus medication on time and other facilities also lack homelike environment. 3. Kh. Haris Ahmad, Senior Advocate Supreme Court cited case law on the subject that if the ailment of any prisoner is such that it is detrimental to his life, he is entitled to the concession of bail. In this behalf, reliance was placed on cases reported as ‘Pervaiz Akhtar Vs. Muhammad Inayat and others’ (1995 SCMR 929), unreported decision dated 05.10.2017 of Hon’ble Lahore High Court, Lahore in case titled ‘Syed Saud Aziz Vs. The State and Another’ (W.P. No.2569/2017 & 2570-2017), ‘Amjad Hussain Gurchani Vs. Sajjad Haider Khan and Another’ (2004 SCMR 12), ‘The State Vs. Syed Qaim Ali Shah’ (1992 SCMR 2192), ‘Muhammad Arshad Vs. The State & Another’ (1997 SCMR 1275), ‘Mian Manzoor Ahmad Watto Vs. The State; (2000 SCMR 107), ‘Zakhim Khan Masood Vs. The State’ (1998 SCMR 1065), ‘Firdous Paul Vs. The State’ (2004 SCMR 15), ‘Haji Hussain Vs. The State’ (2018 YLR 876) & ‘Malik Muhammad Yousafullah Khan Vs. The State & Another’ (PLD 1995 Supreme Court 58). 4. In response to the query of the Court regarding recent judgments wherein principles have been laid down by the august Apex Court for grant of bail and/or suspension of sentence, learned counsel for the petitioner contended that criteria now is ‘extraordinary circumstances and extreme hardship’. In this regard, it was submitted that both are disjunctive and either one situation shall entitle the petitioner to the concession of bail on the basis of medical reports. Learned counsel contended that petitioner is entitled to be released on bail, as his medical condition is such that there are extraordinary circumstances and he is in extreme difficulty, because he is not getting proper care. It was also argued that withdrawal of earlier writ petition (W.P. No.32-2019) does not disentitle the petitioner to be released on bail inasmuch as it is a settled law that if bail petition is withdrawn without arguing, the person is entitled to re-agitate the same. It was further submitted that instant writ petition, which is again a bail petition, is not civil proceedings but rather it partakes the character of proceedings agitated. Reliance was placed on cases reported as ‘Hussain Bakhsh Vs. Settlement Commissioner, Rawalpindi and Others’ (PLD 1970 Supreme Court 1) and ‘Dr. Sher Dil Batra and Others Vs. Director, Federal Investigation Agency and Others’ (1995 P.Cr.LJ 1541). 5. Mr. Jahanzeb Ahmad Bharwana, Additional Prosecutor General, NAB along with Sardar Muzaffar Ahmad Abbasi, Deputy Prosecutor General, NAB, inter alia, contended that instant petition is not maintainable inasmuch as earlier writ petition, on the same subject, was withdrawn. In this behalf, it was contended that prayer, in both the petitions, is the same i.e. suspension of sentence awarded vide judgment dated 24.12.2018 and release of petitioner on bail; it is only the grounds that differ. It was submitted that proceedings in writ petition are civil in nature hence Code of Civil Procedure, 1908 would attract and present petition is barred under Order XXIII and Order II Rule 2 CPC. 6. 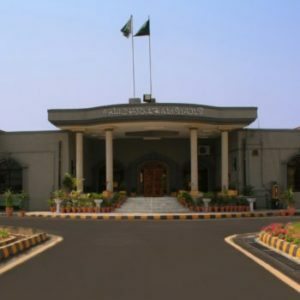 Learned counsel for National Accountability Bureau argued that in three recent pronouncements of Hon’ble Supreme Court of Pakistan in cases titled ‘Tallat Ishaq Vs. National Accountability Bureau through its Chairman etc.’ (Civil Petition No.632-2018), ‘NAB through its Chairman, Islamabad Vs. Murad Arshad & Others’ (Civil Petition No.1707-2018) and ‘Chairman, National Accountability Bureau, Islamabad through Prosecutor General Accountability, Islamabad Vs. Mian Muhammad Nawaz Sharif’ (Civil Appeal Nos. 1340, 1341 and 1342 of 2018 and Civil Miscellaneous Application No.9985 of 2018 in Civil Appeal No.1340-2018), it has been specifically held that High Court, under Article 199 of the Constitution in NAB cases, does have jurisdiction to grant bail but such jurisdiction is to be exercised sparingly in extraordinary circumstances for the reasons to be recorded; that the referred principle applies not only in bail matters but also in application for suspension of sentence. It was also contended that the petitioner is receiving best possible medical treatment and there is no threat to his life. In this regard, learned Prosecutor General, NAB took the Court through the medical reports tendered, especially the latest report to argue that none of the doctors has opined that incarceration of the petitioner is detrimental to his life. This entry was posted in Bail NAB Ordinance, Case Laws, Constitutional Law, Islamabad High Court, Knowledge - Constitutional Law, Litigation & Arbitration, Medical Grounds, Solutions - Constitutional Law, Suspension of sentence. Bookmark the permalink.